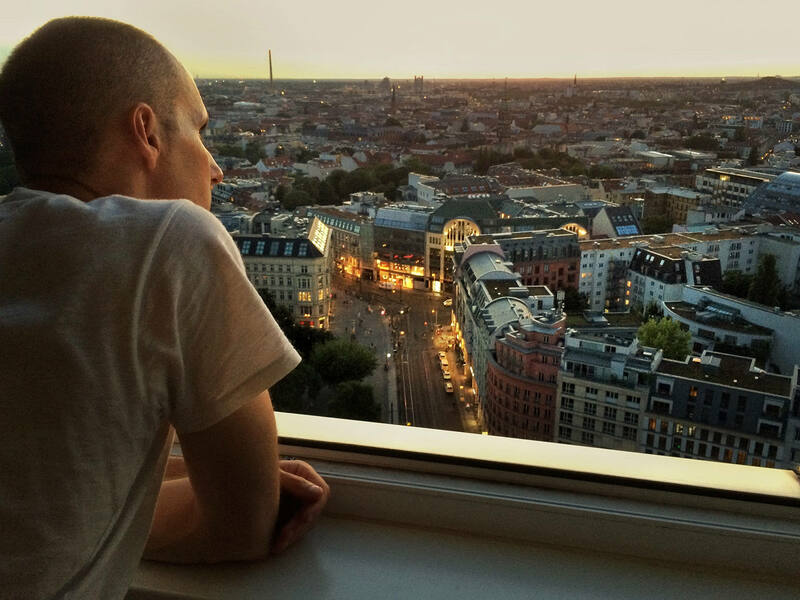 When we were living in Berlin, we almost never stayed in during the weekends because a weekend getaway out of Berlin was so easy and cheap. One of the weekend trips from Berlin we would do is visiting Dresden (10 euros on Flixbux!). We like Dresden a lot. Along with being the location of our favorite bar in the whole world, Dresden is simply a beautiful city. Walking around the historical area, it’s easy to forget that the buildings and the palaces are not as old as they appear. Everything here has been re-built since the whole city was completely razed during World War 2. Pro tip: While in Dresden, take a walking tour from DresdenWalks (12 euros). Consider yourself lucky if you get Karen Reimann as your guide. As an American expat with historical building preservation background, she made us laugh and cry and fall in love with Dresden. Our favorite part about Dresden isn’t actually in the city itself, but this little known (at least to us) park 30km away called Saxon Switzerland National Park (or ‘Saechsische Schweiz‘ in German – now try saying that 3x). 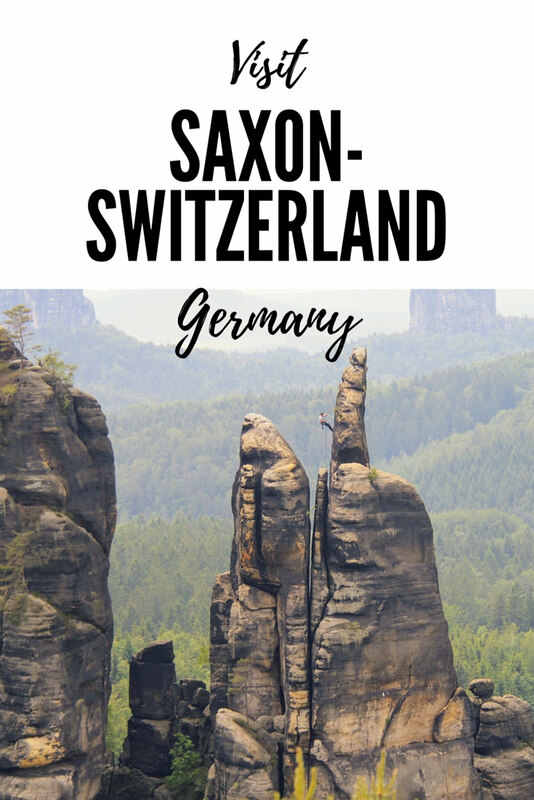 I’d never heard of Saxon Switzerland until after we moved to Berlin, but it became our favorite ‘discovery’ in Germany. If you’re looking for an adventurous weekend getaway from Berlin, Saxon Switzerland National Park is where you need to go. I mean this park has it all: the famous Bastei Bridge, a river to kayak in, hiking trails, via ferratas, scary climbs, and biking trails set in a beautiful countryside complete with small villages, and this being Europe – a castle. You can visit Saxon Switzerland as a daytrip from Dresden (or even Berlin), but with a view like this – why would you? You can a little ferry boat like this to cross the Elbe River. With its towering sandstone rock spires Saxony Switzerland has a long and proud tradition in rock climbing. The first recorded ascent dates back to 1874. One can argue that this is the birthplace of European free climbing. There are many routes that will take you to the top of these towers. 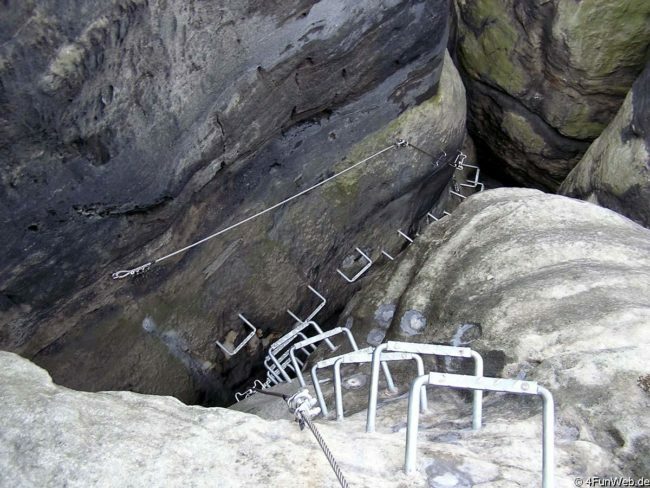 However to protect the rock, there are strict rules you have to know if you want to climb in Saxony-Switzerland. You can only use existing rings for protection (in some routes, there might be only 2 or 3). No metal pros and no chalk are allowed. The hiking here is fabulous and adventurous in its own way. There are multiple viewpoints around the park that are connected by vast network of trails. 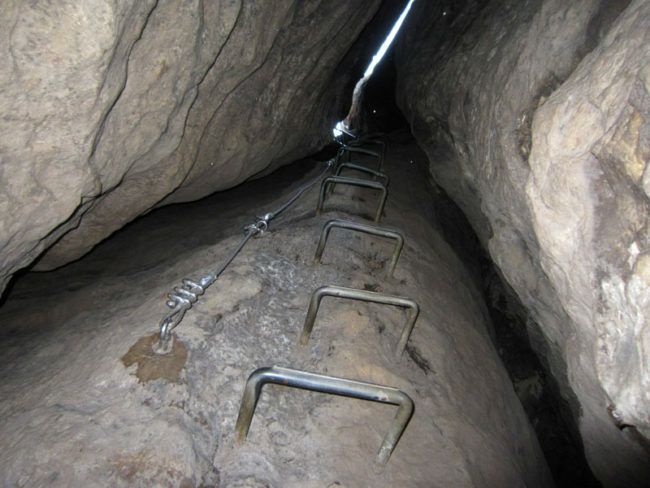 Some of these trails are short sections of via-ferrata: sets of iron bars drilled into the rock requiring some dexterity and sure-footedness to navigate. They’re not particularly difficult but you definitely don’t want to slip. Not to worry though, these via-ferrata sections are clearly marked (black arrow) on the trail so you can always avoid them. Other sections of the trails can be slippery and slabby as in the nature of trails on sandstone. A little scrambling might be required to go past these sections. Steeper parts of the these trails are secured with handrails or chains to help pull yourself along. The Bastei The Bastei is the most popular day trip destination in the park, probably because it’s one of the viewpoints you can drive to. From this viewpoint you can see the meandering Elbe River and the picturesque landscape of surrounding cliffs. This is also where the famous Bastei Bridge is located. The bridge that’s on every postcard sold here. Another vantage point from Bastei. It’s so pretty up here. Schrammsteine Loop This half-day hike takes you pass a cave (Idda Grotte), along a ridgeline, and end in Schrammsteine, one of the best viewpoints in the area. The view was incredible and the hike is varied involving a little scrambling, a little exposure, some steep ladders, and narrow walkways. It’s super fun and highly recommended. 4-5 hours. You can take a tram from Bad Schandau to Bauthenfall where the hike starts. Variations of this hike is possible. For example, instead of doing a loop, we choose to hike down to river from Schrammsteine viewpoint. It can get pretty windy, make sure to bring a jacket. Uttewalder Grund or Utterwalder Gully explores the lush and green gully below the spires. It’s a different world down here. Green and humid, in some parts it almost felt tropical with very little sunshine reaching the ground. We started our hike from our Airbnb in Stadt Wahlen – Utterwalder Grund – Bastei and it took us 3-4 hours. Uttewalder Grund is like walking through a mini rainforest. We lived in Berlin for 6 months and we traveled almost every weekend (10 new countries!). But in terms of value and ease of travel, Dresden and Saxony-Switzerland was our favorite weekend getaway destination. The nature here is so gorgeous and the hiking so fun and varied. Have you ever been to Saxony-Switzerland before? Do you agree? As usual, our favorite app, Maps.me (free on iOS/Android) came to the rescue. It has enough details of the various trails, summits, and viewpoints of Saxony-Switzerland for us to confidently wander around on our own. Getting to Dresden from Berlin: Flixbus (10 euros). Dresden to Saxony-Switzerland: Saxon Switzerland is located 30 kilometres southeast of Dresden, the capital of Saxony. Regional trains (“S-Bahn”) connect Dresden and Saxon Switzerland at least every 30 minutes during day time. There are many villages that the Dresden – Saxony train passes by that can make a good base to visit the region. We stayed in Villa Sophie in Stadt Wehlen. Bad Schandau, Rathen, and Königstein also make good bases. A day trip from Dresden is also possible, but the region is so beautiful I’d recommend staying overnight. Bad Schandau is probably the most convenient base since it’s the closest to the park, but we found that it’s also the most expensive. The park borders the River Elbe on one side and you can either use the train or a barge to go along the river. Within the park itself, public transportation is limited. There’s a tram that you can take from Bad Schandau to various trailheads/stops, but it’s slow and it doesn’t come very often. You need to take this tram to access the trailhead for Schrammsteine Loop hike described above. There’s also a busline that connects major points within the park. This brochure has a LOT of details about visiting the park (the last 2 pages are especially useful). Hello! Thanks so much for your post. I’m headed to Berlin in about a month and was hoping to find some amazing hikes in the area, looks like I’ve found them! Do you have any experience with storing your luggage in lockers in the train station? Or anywhere else that we could do this? We will be traveling from place to place, often, and won’t have a hotel etc to store our stuff at. I’m concerned about where we’ll put our belongings when exploring various areas like Saxon Switzerland and Spreewald. Any suggestions? Loving this post, we live in Dresden and also love the Karl May Bar, in fact we were there this week for my husbands birthday! So cool that you like Dresden, I thought it wouldn’t be hip enough for most Berliners, lol. What were your other favourite day trips from Berlin. Found your post via FTB Pinterest. Saxon Switzerland is a mountainous hiking area and national park around the Elbe valley south-east of Dresden in Saxony. The Malerweg in the Elbe Sandstone Mountains is one of the most beautiful and popular walks in Germany. Thanks for sharing your experience and beautiful pictures!!!! I’ve been following your blog for some time now, and awww, Sächsische Schweiz!!!! One of my favourite parts of Germany!!! My husband and I explored it for a long weekend a couple of years ago and I remember going there as a child. So much fun with all the ladders and rungs on various hikes!! Did you explore the castle as well? We didn’t have time for it in the end but would love to know if you thought it worth it. Also, we stayed across the Elbe from Bad Schandau and that seemed less pricey than Bad Schandau itself. Hi Kati, we never quite made it to the castle, I think we got castled-out pretty quickly during our time in Europe 🙂 Good tip about staying across from Bad Schandau. Haha, yes, there are just way too many castles to explore, I agree! !